If you have been injured in a boating accident, in addition to pain and suffering you may be facing mounting medical bills and lost wages. An experienced civil litigation lawyer can help protect your rights and determine whether or not you have a claim during these otherwise difficult times. California is a wonderful state of outdoor enthusiasts. However, when negligent behavior is involved, even a sailboat adventure can quickly turn dangerous or deadly. 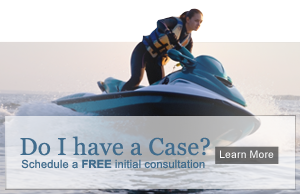 While a boating accident typically involves boat collisions, or boats running aground, personal watercraft such as jet skis can also be involved. Depending on the negligence of the other party, the circumstances surrounding the accident and the catastrophic nature of the injuries, you may be able to recover damages for any injuries sustained while boating. If your accident occurred while on a navigable waterway, admiralty laws will govern both State and Federal claims. Rest assured that we are familiar with admiralty law and maritime accidents and we’ll work to prepare and develop a legally sound case. Our attorneys are licensed to practice in all of the local Federal District courts in addition to the California Superior courts. Boating while under the influence of alcohol is frequently a factor in boating accidents. In fact, drunken boating has become so prevalent that the same criminal consequences which govern DUI have now been applied to boating while intoxicated. In addition to ensuring that you are fairly compensated for your injuries, medical expenses and lost wages we will work hard to make sure that any claim for property damage is handled fairly and expeditiously. We do not take a fee on property damage claims handled in conjunction with a personal injury claim. At Iler & Iler, LLP we provide skilled representation and attentive service to every client that retains our services. Unlike may other personal injury attorneys, we actively monitor the medical management of personal injury cases and communicate regularly with our clients to ensure that they are receiving medical care that is reasonable and consistent. Boating accident cases have important statutes of limitation that must be complied with in order to protect your rights. Don’t let this important deadline pass, call Iler & Iler, LLP today. Please contact our office at (800) 479-2453 or via email at info@ilerlaw.com to schedule a free initial consultation. We represent clients on a contingency fee basis, meaning there is no upfront cost for the claim and we get paid only if we win or settle your case.